In our home, we love sweet potatoes as a side dish or even as the entree when surrounding by a plethora of colorful, lightly steamed or sauteed veggies! 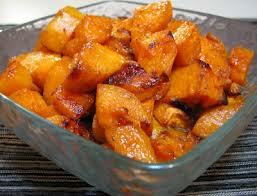 This recipe is amazing; it gives the sweet potatoes a little kick with the lime juice and some spice with ginger. And all while helping you and your family to eat right. Check it out! This delicious dish can make a nutritious side dish for you and your family! Coconut Oil Roasted Sweet Potatoes definitely gets my children excited about a healthy meal and I hope you enjoy it as much as we do!